The Grand Wailea Resort in Maui is my favourite out of all the Wailea hotels we saw due to its perfect combination of upscale elegance, sophistication and fun for all ages! The four-and-a-half star Grand Wailea Hotel has by far the best pool area in all of south Maui and is located in front of one of Maui's best beaches: Wailea Beach. For a nice night out, check out the island cuisine at their floating seafood restaurant: Humuhumunukunukuapua'a. Wondering where they came up with a name like that? They named it after Hawaii's state fish! Since a lot of people find the name to be a bit unwieldy, it's often called by its nickname: "Humu Humu." Other options for dining and drinks here include The Grand Dining Room Maui (breakfast buffet and a la carte items,) Bistro Molokini (California and Island Cuisine,) Cafe Kula (a gourmet deli,) Volcano Bar (casual food and exotic drinks brought to you poolside,) the Grotto Bar (a very cool swim up bar,) and the Botero Gallery Bar where you can enjoy a drink amidst nine gorgeous Botero sculptures. I highly recommend that you check out a luau during your stay and the resort makes it easy for you by putting on a great show right here at the resort: The Grand Luau at Honua'ula. I have to tell you, the pool area is AMAZING. INCREDIBLE. OUT-OF-THIS-WORLD. It just goes on and on from one cool thing to another - whether you're at the Grand Wailea Resort in Maui as a couple, or you have kids, you're sure to LOVE the pool here. Or should I say pools. Can you believe they have NINE pools here? 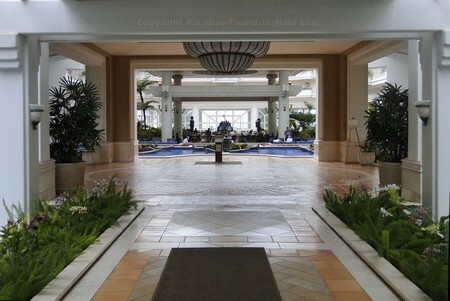 For a quiet, relaxing adults only pool, check out the Grand Wailea Hotel's formal Hibiscus pool with it's gorgeous mosaic Hibiscus flower inlaid on the floor. If you have kids (or are just a kid at heart yourself,) you can explore and whoop your way down the resort's seven waterslides and white water rapids, past waterfalls and grottos and caves. Older kids will have a ball at the Tarzan rope swing. Little ones will love splashing about at the sandy "baby beach." And no, that's not a beach in the open ocean, but a man-made beach in the Grand Wailea Hotel pool area - it's very cool. 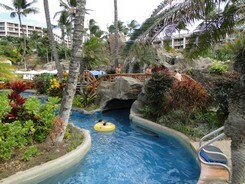 See more of the cool stuff at the Grand Wailea Hotel pool! Even on a cloudy day, it's paradise! If all that playing around has you in need of some rest or refreshments, you can check out their whirlpool and sauna, or grab a cold exotic drink from the swim-up Grotto Bar. And be sure to check out the white sand Wailea Beach out front too - it's beautiful, and was even named "America's Best Beach" by the famous Dr. Beach. The Spa Grande: "The Top Hotel Spa in Hawaii"
Named the "Top Hotel Spa in Hawaii" by Travel and Leisure magazine, this 50000 square foot spa is the largest spa in all of Hawaii. They offer oodles of heavenly sounding spa treatments in their 40 treatment rooms. Even the stuff you get to indulge in before the treatments sound wonderful: a Roman Tub, exclusive Hawaiian sea salt baths and more. The awesome pool area is fantastic and all, but the fun stuff for kids at the Grand Wailea Resort Maui doesn't end there. 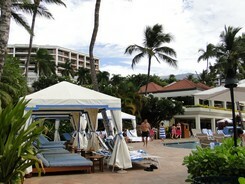 The Grand Wailea Hotel also has a 20000 square foot children's resort known as "Camp Grande." Made for kids ages five to twelve, it has a kids restaurant, craft room, theater, game room and all kinds of fun activities such as lei making, hikes, workshops and more. There is also a special play/activity area for children aged 4 and under that are accompanied by an adult! The Grand Wailea Hotel has an assortment of shops in the lobby featuring resort wear and accessories, fine jewelry, spa products, footwear and more. 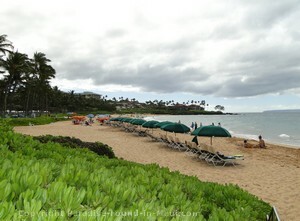 Also close at hand is the neighbouring 64000 square foot "Shops at Wailea." 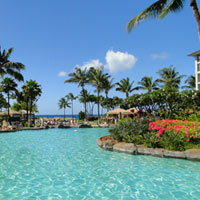 The Grand Wailea Resort in Maui has 780 guestrooms and 52 suites. There are the 640 square foot "Guestrooms," the exclusive "Napua Rooms" in the Napua Tower, and their opulent suites which range in size from 1300 to 5500 square feet. Anyone want to live the lifestyle of the rich and famous? 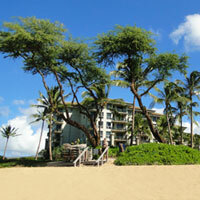 The Grand Wailea Hotel is located at 3850 Wailea Alanui Drive. 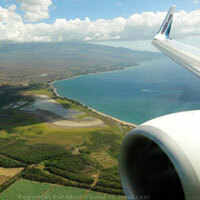 As you leave Kahului Airport, you'll be driving down Keolani Place (route 380.) You'll notice the name change to Kahului Airport Road (still route 380 though.) When you get to the intersection with the Haleakala Highway (route 37), ignore it and continue to follow route 380 past the Costco and Kmart - you'll notice the road has changed names yet again and is now called Dairy Road. Follow route 380 until you get to a set of lights at the intersection with Puunene Avenue (route 311) - you'll see a huge church on your left just after you pass the Home Depot. Turn left onto route 311. Drive south along route 311 as the name changes to the Mokulele Highway. After driving about 8 miles, you'll see the turn-offs for Kihei. Ignore these and continue along route 311 as the name changes to the Piilani Highway (now route 31). Follow the Piilani Highway for about 6 miles to the very end where the road turns to the right - this is Wailea Ike Drive. At the end of this street, you'll make a left turn onto Wailea Alanui Drive. The first resort you see will be the Grand Wailea on your right. If you get to the Four Seasons, you went too far, so turn around and head back! I highly recommend Booking.com if you're looking for the best rates. 1.5 million rooms are reserved on their site every day with ZERO booking fees and their promise to price match. Click here to get more info, read customer reviews, or book your room!